Annually the Tattersalls Ireland July Show committee make a donation to St Francis Hospice. For the past number of years, the show, in association with the Rolestown Show and Ward Union Hunt has been run with all proceeds going to this invaluable service. The Hospice, located in Raheny and more locally in Blanchardstown, provides palliative care, day care, bereavement support, therapy, physiotherapy and outpatients clinics and services the area invaluably. 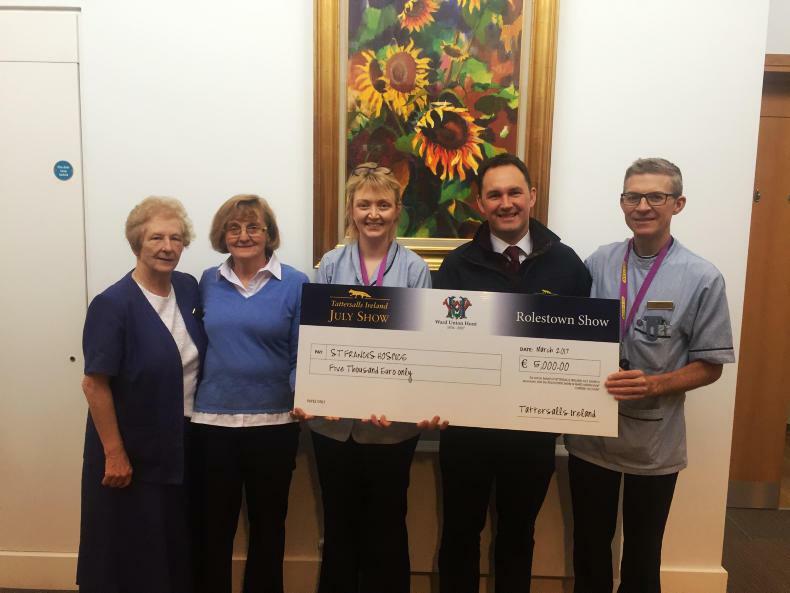 The presentation of €5,000 was made by Roger Casey, Managing Director of Tattersalls Ireland and Gladys Graham, Secretary of the Tattersalls Ireland July Show to Sr. Margaret Cashman and Clinical Nurses at St Francis Hospice, Andrew Connolly and Julie Burke. For 2017, the Tattersalls Ireland July Show will revert to its original calendar slot of Saturday 22 and Sunday 23 July. Planning is already in its advanced stages and the original two-day schedule will cater for a wide range of classes including working hunter, showing classes, side-saddle classes, in-hand classes and a selection of National Show-Jumping classes including the Premier Grand Prix. New for 2017, Tattersalls Ireland July show will host the only Dubarry Young Event Horse Qualifier in Ireland where the final will take place at the prestigious Land Rover Burghley International Horse Trials. This is the first time a qualifier has been hosted in Ireland and is sure to draw a crowd of both competitors and spectators alike.